The Black Hawk Statue remains shrouded in black while the state budget is in the red, but a state representative promises to do what he can to help both. “I will strongly advocate for including the Black Hawk restoration project in any capital bill discussions, and will continue to stay in communication with DNR [Illinois Department of Natural Resources] for updates and news regarding the project,” State Rep. Tom Demmer (R-Dixon) wrote in an email last Friday. The much-needed repairs to the surface of the 106-year-old Black Hawk Statue at Lowden State Park near Oregon have been side-tracked by the state legislature’s failure to pass a budget and red tape. 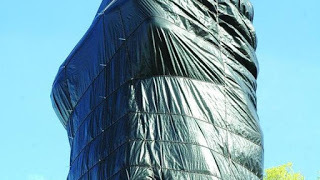 Meanwhile, the local landmark has been wrapped in black plastic since late last November to protect it from further damage. Demmer said he has been in frequent contact with IDNR officials and has found out that. Read more here.